These Large Antique Reproduction Crystal Chandeliers feature iron, gold or silver finish in patinaed metal or painted finish draped in crystal. Oval chandeliers are ideal for a long dining room table or over a bar. 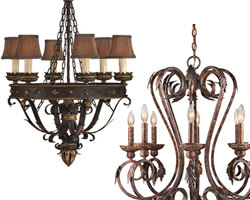 These oval antique reproduction chandeliers bring a rich tradition of style elements drawn from history. Foyer Pendants are generally taller than they are wide. They are ideal for a foyer with a high ceiling. Fitting with the Antique Reproduction styles, they feature metal finishes that draw on historic sources. Open lantern style pendants incorporate elements from a variety of historical sources. With antiqued or painted finishes and intricately designed cages, Antique Reproduction Lantern Pendants enhance a foyer or a high ceiling. Smaller Pendants in Antique Reproduction style combine historic elements in diffused down-light. Hang a small pendant over your kitchen sink to coordinate with your chandelier. Hang a Series of Antique Reproduction Mini Pendants over your bar, kitchen island or long dining table. These linear pendants in Antique Reproduction style are ideal over an island or a long dining room Table. Many have the down lights to light a pool table with out compromising your traditional or historic interior design. This collection of crystal ceiling lights coordinates with a variety of styles. Always a classic, these beautiful ceiling lights, in flush and Semi-flush are always in style for halls, bedrooms, entry ways, even kitchens. These wall sconces coordinate with Old World Antiques or Antique Reproduction furnishings. These sconces incorporate elements from a variety of historical sources. Drawn from historic sources, these wall brackets work with a variety of formal or traditional interiors. Look for iron, gold or silver finish in patinaed metal or painted finish. Crystal wall bracket sconces influenced by historic lighting, these wall bracket sconces work with a variety of formal or traditional interiors. Fine Art Lamps products are made in the USA. Many can be customized and may be converted to 220v. These wall brackets coordinate with traditional or antique style interiors at a lower price point. Beautiful, elegant bath lighting to coordinate with English, European, Florentine, French Country, Historic, Medieval, Old World, Palladian, Parisian, Queen Anne & Queen Anne Revival, Renaissance, Rococo, Romantic, Tudor and Victorian Styles. Traditional, Antique Reproduction, Art Deco and Art Nouveau Desk Lamps to coordinate with a variety of historic inspired or traditional interiors. These desk lamps combine form and function. This collection of decorative mirrors, lighted mirrors and girandoles feature European patinas and other antiqued details. The finishing touch to your chandelier or ceiling fan, don't forget a ceiling medallion. Finished to match your ceiling or to coordinate with your lighting, this architectural design element adds scale and importance to your interior design. The right ceiling medallion will add a historic eleent to any room. This wide array of ceiling medallions include shapes, sizes and styles to coordinate with any room and any chandelier, pendant, ceiling light or ceiling fan. Choose from a wide range of ceiling medallions. They are organized by size from 7" to 12" small ceiling medallions all the way to 35" to 70" very large ceiling medallions. We also offer Ceiling Rings and Rims, Ceiling Domes and other architectural millwork. We also have clear Ceiling Medallion installation instructions. 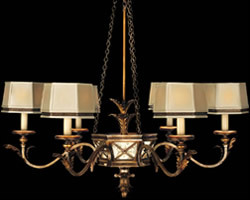 Fine Art Lamps has a long tradition of fine craftsmanship and artistry handcrafted exclusively in America. 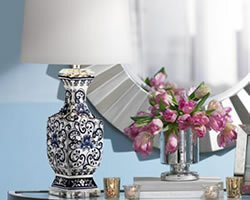 These beautiful items offer the superior level of quality and service expected from a luxury product brand. Fine Art Lamps is headquartered in Miami, Florida . Most Fine Art Lamps products can be customized and may be converted to 220v.